My most memorable cows (yes, cows, not cow) of the day appeared in another episode of Curious George tonight. Have you noticed we’re stuck in a Curious George trend? I’ll admit I don’t mind it so much. The episodes are actually well done for preschoolers and I like the real-life applications featuring real kids at the end of each episode. Tonight’s Curious George’s episode featured a baby opossum and at least a dozen cows frantically running around the barn at night. I didn’t see how this mess started but the numerous moos are what made me look at the screen. When I saw the multiple cows running across the screen, I thought I was suffering from vision problems. I’m better now that the episode is over, thanks. 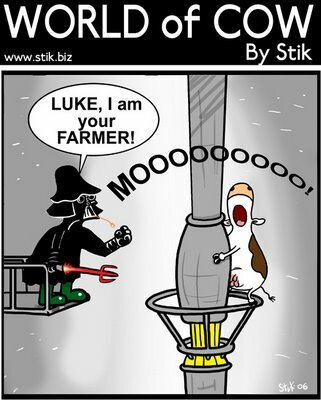 Rather than showing you these crazy cows, let me share a little bovine humor today. 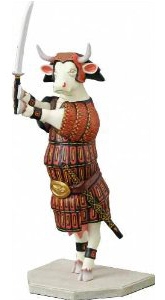 I’ve been looking at funny cow images for inspiration to start a children’s book. 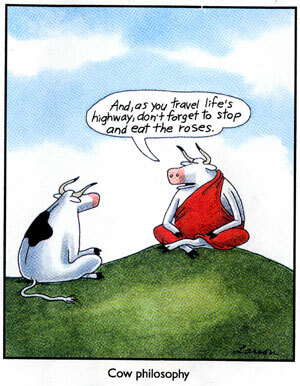 While doing my research, I ran into some pretty fun cow cartoons and I hope you’ll appreciate them too. 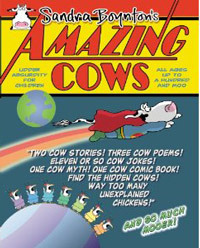 Enjoy the funny cow sighting overload! My favorite cartoon has to be Star Wars. What about you? I just remembered something interesting I have been meaning to tell you and keep forgetting….on my hubby and I’s anniversary, we played Trivial Pursuit 90’s and he asked me a question about Norma Lyon and what she made her statues out of…..because of YOUR blog, I guessed right, BUTTER! :) I would have never known otherwise. I told my hubby I knew the answer because of the blog I read about cows! Haha, how funny! Until I blogged about her I would have had no clue either. I hope you won the game! I lost the first round, but the second round(in which he asked me that question) I actually DID win! :) YAY! Oh, they’re all good, but I especially like the one about the movie “Milk”. 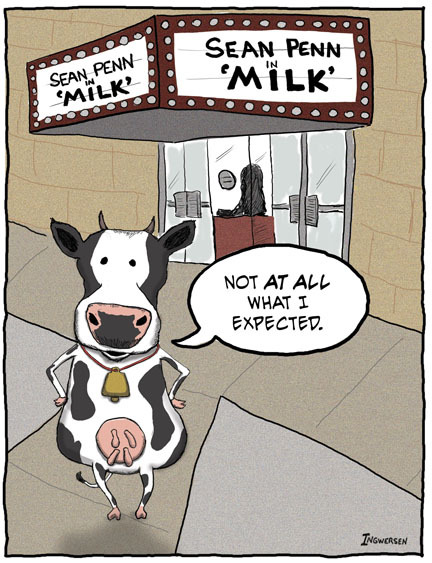 The poor cow felt mislead. Too funny! Thanks for stopping by! I’m glad you enjoyed your visit and shared your cow story, even though it obviously didn’t have a happy ending, at least for the cow.